A window blind, mounted on a wooden or metal roller, that rolls up and out of the way when not in use. Blockout roller blinds are thus named because they block out light (as well as heat). They are therefore ideal for bedrooms. Translucent roller blinds reduce light/heat and are perfect for areas where privacy is desired but some light is still preferable. Transparent/sheer roller blinds reduce light/heat, but still enable a limited view. Finally, screen/sheer roller blinds reduce light, heat and glare, but maintain the view. 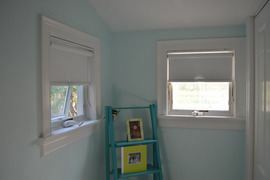 Roller shades are the most economical type of blind, running from $20 to $60 for a 27 inch window.